Few of us have sprawling estates where we can lie beneath the canopies of towering oaks and majestic pines. We need to visit a park or arboretum to do that. For most of us, our patches of ground are significantly more modest. In urban areas such as Seattle, residential lots can be as small as 2,500 square feet, and cottage developments might have as many as 12 houses on 6,400 square feet! How can we transform our postage stamp-sized garden plot into a little piece of paradise? Tall, narrow plants don’t require much real estate but can add a lot of punch to your garden. Many conifers get quite tall, but remain just a few feet wide. Among the narrower selections are Italian Cypress-- Cupressus sempervirens ‘Tiny Towers’ is a good choice with its diminutive scale and striking gray blue foliage. 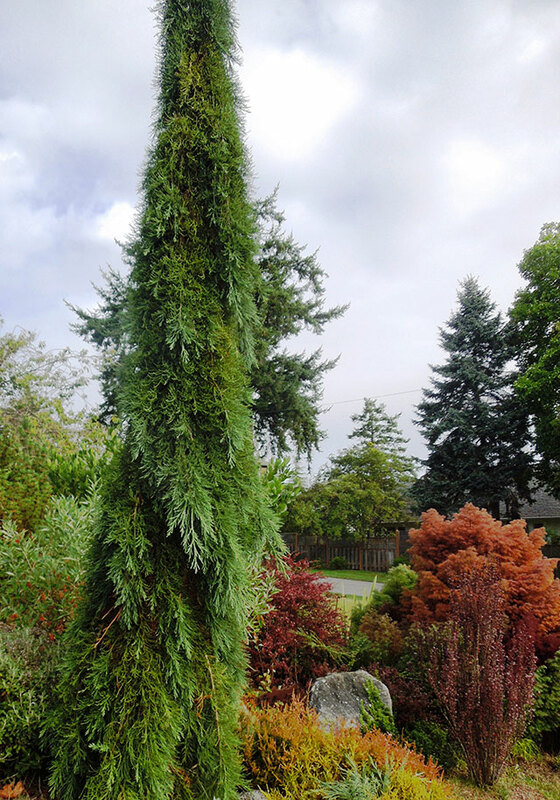 Other forms to consider include Weeping Sequoia (Sequoiadendron giganteum ‘Pendulum’); Weeping Alaska Cedar (try Chamaecyparis nootkatensis ‘Van den Akker’); and Contorted Japanese Larch (Larix kaempferi ‘Diana’). If you have room for only one tree, selecting it can be agonizing. In addition to ultimate height, think about form. Generally, a tree for a small garden should be taller than wide. 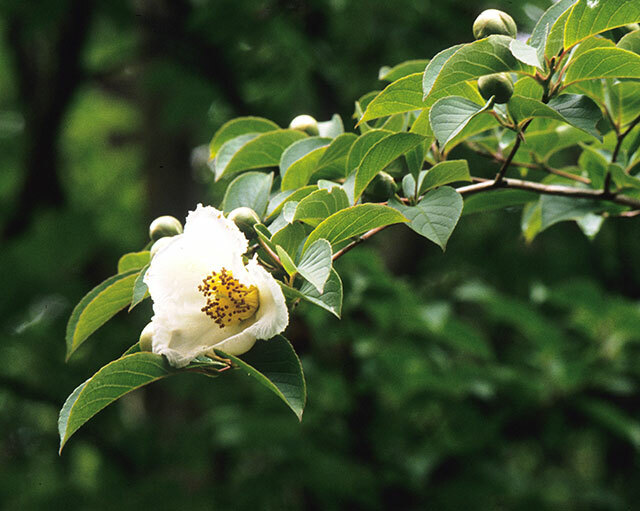 Japanese Stewartia (Stewartia pseudocamellia) is an exquisite four-season tree that reaches 25 feet tall but only 6 feet wide after 10 years, and it lends itself to being “limbed up” (having lower branches removed) if need be. Many Japanese maples are suitable for small gardens, but again select one with an upright form as many have a wide-spreading lateral branching pattern. Some large shrubs, including many species rhododendrons, can be arborized (trained into a tree form) so that they essentially become stately small-scale trees. Rhododendron auriculatum is one that bears fragrant white to light pink flowers in mid to late summer. Two websites can be helpful in narrowing down the choices. The “Great Plant Picks” website has trees listed in the category, “Small Spaces—Big Impact! ,” and the City of Seattle Master Tree List has approved trees listed by size, from large to small. Be careful, though. Just because a tree is listed as being appropriate for small spaces doesn’t necessarily mean it will not outgrow your site. Some plants are fairly easy to train into a two-dimensional form against a fence or wall. Branches to the left and right of the main trunk are retained, while those growing forward or backward are removed or pruned back. This technique is called espaliering. Edible fruit trees are often espaliered because more trees can be grown in a given area and flowering branches will receive more light and grow better fruit. When trained against a trellis, an ornamental shrub essentially becomes a fence or screen, and the effect can be lovely, as well as space saving. Large shrubs can be espaliered in planting beds only a few feet deep, or they can be espaliered at the backs of larger beds, allowing for a greater variety of plants in the foreground. Some larger shrubs that lend themselves to espalier include Witch Hazel (Hamamelis), Autumn Camellia (Camellia sasanqua), and Strawberry Tree (Arbutus unedo). All of these have attributes that make them attractive year-round. Witch Hazels have fragrant winter flowers followed by “corrugated leaves” and stunning fall color. The fragrant white flowers of Camellia sasanqua ‘Setsugekka’ contrast with its dark, glossy leaves. The fall fruits of the Strawberry Tree appear together with its small urn-shaped white flowers, and its peeling cinnamon-colored bark and leathery evergreen foliage provide interest throughout the year. Don’t forget the ground plane. Small shrubs compliment larger plants in your garden by providing contrast. Several heavenly scented daphnes are appealing when planted in small groups. Among them are the winter-flowering Daphne odora ‘Aureomarginata’, the long-flowering variegated daphne, Daphne transatlantica ‘Summer Ice’, and the compact evergreen, Daphne tangutica, whose red fall berries follow summer flowers. Pieris japonica ‘Cavatine’ is another miniature that has striking evergreen leaves year-round, as well as large clusters of urn-shaped flowers in late winter to early spring. A deciduous shrub with lovely foliage is Spiraea japonica ‘Magic Carpet’. Reaching only three feet tall, the early spring leaves on Magic Carpet Spirea are brilliant orange yellow softening to orange-blushed chartreuse as it evolves. If it begins to look “tired” in the summer, cutting stems back will encourage a fresh flush of new foliage. A favorite from Australia, Alpine Bush Mint (Prostanthera cuneata), tops out at under 2 feet tall, has tiny aromatic evergreen leaves, and thrives on little or no water once established. A trio of wonderful low shrubs suitable for a small garden. Top: Fragrant spring and summer flowers of Daphne tangutica are followed by red fruits in the fall. 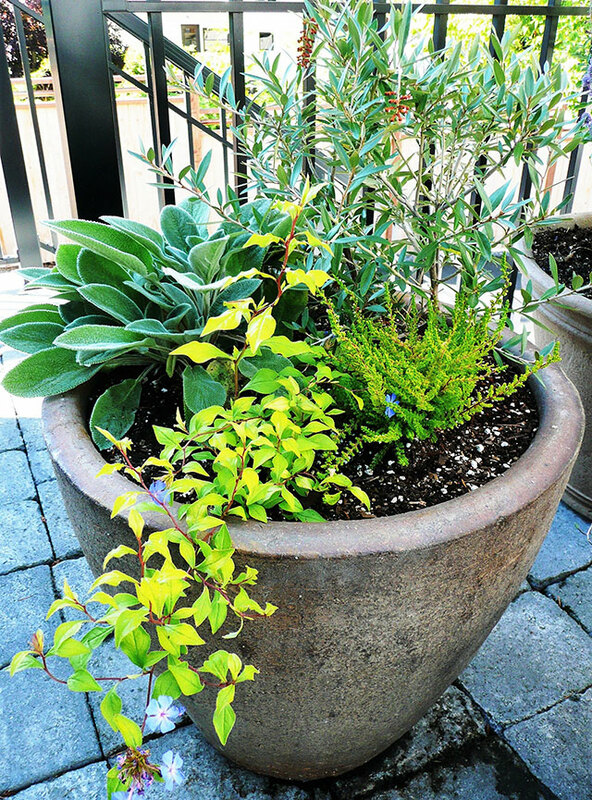 A planted container is a garden in miniature that can transform a barren entryway or patio. Plants soften hard elements and provide depth, in addition to interesting texture, form, color, scent, etc., to an otherwise static space. The axiom, “thrillers, fillers, and spillers,” is a handy guide when designing a container planting. Select a focal plant (thriller) with striking scale or form, such as a large, spiky yucca, surround it with soft plants such as heuchera, and drape it with lush spillers such as cascading calibrachoas. Keep in mind that the vessels you choose for your container display are sculptural elements that should reflect your personal taste and compliment the style of your home. Sadly, some exquisite plants are simply not suitable for small gardens. Deciding which ones to rule out is somewhat subjective, but here are a few you might want to think twice about incorporating into your petite plot. The late spring blue flowers of Ceanothus are seductive, but you might eventually decide its drawbacks outweigh its attributes. There’s little to recommend the plant after the flowers fade. 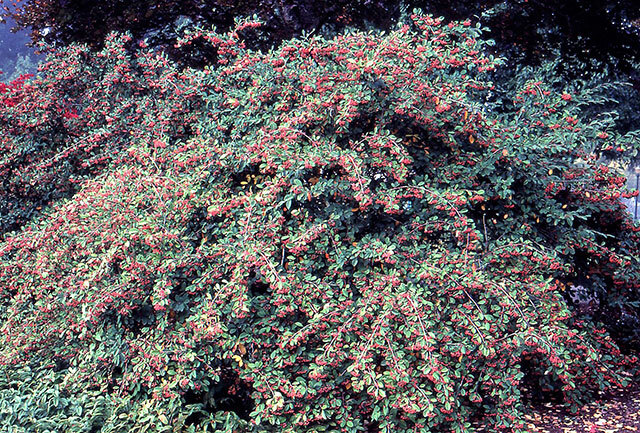 Over time, most Ceanothus varieties become supersized, and the blotchy stems that persist after flowering are hardly ornamental. Other plants you might consider eliminating from your list include those whose branches arch from the base, such as Cotoneaster lacteus and Doublefile Viburnum (Viburnum plicatum var tomentosum ‘Mariesii’). You might similarly pass up large shrubs with rounded forms that don’t lend themselves to arborizing. Aucuba and Eleagnus fall into this category. In a small garden, every plant is critically important as there is no space to waste. Gardeners are often seduced by a plant’s flowers, but flowers are fleeting so try to select plants with year-round attributes such as fragrance, fall color, texture, beautiful bark, or interesting form. If you find yourself immobilized by uncertainty, consider asking a landscape professional for help. Landscape designers can help you select the best plants for your site and assist you in creating a little piece of paradise in your own backyard—transforming it into a backyard you can’t wait to come home to!